Ultimate Heartthrob Piolo Pascual didn't mince his word in admitting that he did bar ABS-CBN talent management arm Star Magic from making offers to his son Inigo Pascual. The Hawak Kamay star revealed this during his live appearance on the Sunday episode of The Buzz saying that, "Yes there were offers but sabi ko 'Wag na po muna, patapusin ko muna ng pag-aaral.'" He added that this decision of his actually goes against his son's choice since, "Gusto niya dito. Nagusap [lang] kami ng Mommy niya, patapusin muna natin ng high school." Piolo continues, "Ako naman kasi my only concern is studies. Kasi once na nag-artista na 'yan, hindi mo na mapipigilan 'yan eh. And when work gets in the way of course they'll choose to prioritize work." Despite his obvious resistance for Inigo to join showbiz, the Kapamilya hunk recognizes the fact that he would eventually need to budge to his son's desire. "Hindi ko na siya mapipigilan dahil ito pa nga lang wala pa siyang 18 may offer na. So sabi ko 'Why not it's in the States. Once you get big in the States, automatic malaki siya sa Philippines. So diyan ka muna palaki ka muna,'" he said. His current deal with his son is to finish high school before he could let him be int he limelight. "Sabi ko 'Maski high school nalang. 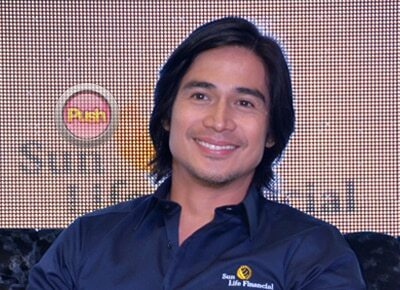 Bigyan mo nalang ako ng high school diploma and you're on your own,'" revealed Piolo. The box office actor's teenage son is currently in Nashville, Tennessee training for the Christian boy band where he was personally handpicked by a talent manager to join. Meanwhile, another issue that Piolo answered were the reports that his rumored romance with his former On The Job co-star Shaina Magdayao has gone cold. Speculations about his and Shaina's growing apart were spurred by their recent lack of public appearances together. To this, Piolo explained, "Shai and I are good friends eh, she's friends with my family, i'm friends with hers. I guess mas pinipili lang po siguro naminna i-preserve ang friendship namin." The 37-year-old star further elaborated that their busy schedules have been the main factor why they had to lie low as special friends. "Siguro lalo nako dahil hindi ko rin mabibigan ng oras if ever i'm in a relationship. I have a son, I have a career, I have my life. So, unfair. Sa 24 oras na meron ako sa isang araw hindi ko po kayang isiksik 'yun sa isang araw. So I just have to be fair I guess," he confessed. This doesn't mean though that Piolo is completely shutting his doors to love, as he even confirmed in the interview that he hopes to settle down with a woman who is in her mid-20s and hopefully even father at least four children in the future.